Finally after months of hibernating in it's quilted pouch, the red and white sampler is out and it's a pleasure to pick it up again! I took it with me on a recent trip to Paris visiting an old and dear friend, while dear daughter did her first internship there. 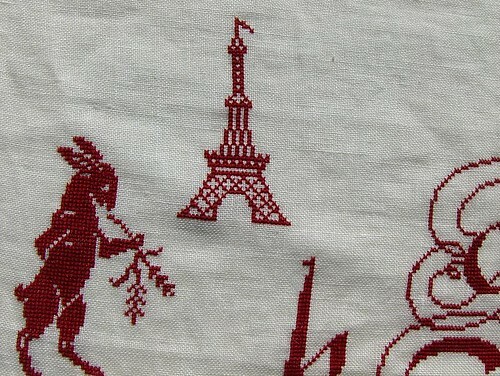 What better way to remember the visit than to stitch the famous icon on the sampler? After many months away from stitching, I was happy to find it didn't take long for my fingers to find their rhythm and it was a true pleasure to stitch again! Guess it may be true of stitching as well that absence makes the heart grow fonder...? 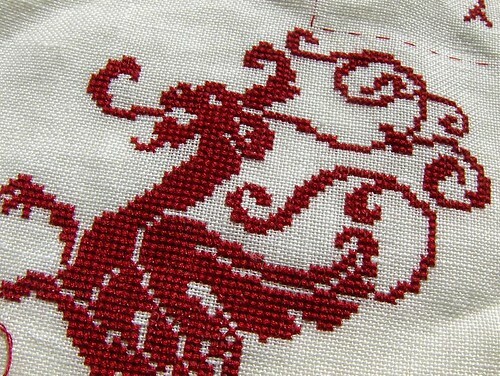 Next is a shot of the dragon - my lucky charm. A bit of a fiddle and not one I can do while chatting over a cup of tea, as I had to take out a few mistakes and am still deciding how or if I'm going to correct some others...but he's cool, and I always leave mistakes in my work so...I'll think about that one while working on other parts of him. 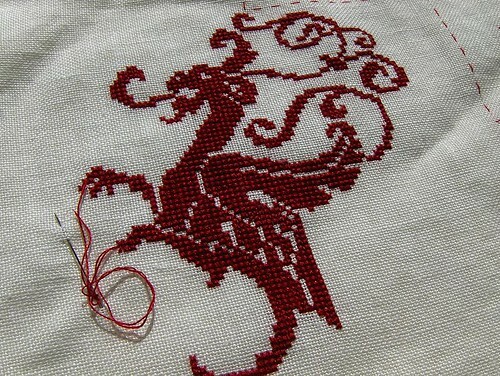 So now my handwork time is divided between quilting and cross stitch, restricting myself to two projects - hmm...both red and white at the moment, come to think of it! The red and white log cabin quilt is "almost" done - 7 more blocks to do - the other blocks are already sewn and make up the nearly completed top. As soon as it's done I'll post it so you all can see!